Officials with the Iroquois Nationals lacrosse program are gearing up for their final preparations of what they hope will be another medal-winning performance at a world championship. The men’s team will compete at its world field lacrosse tournament scheduled for July 12 to July 21 in Netanya, Israel. The Iroquois Nationals captured their first medal at this global tourney – a bronze – at the last world championships staged in 2014 in Denver. The Iroquois Nationals’ 23-player roster will feature Indigenous lacrosse stars who live in Canada and the United States. Members of the squad will be converging this Sunday for some meetings and a scrimmage in Syracuse, N.Y. The club is expected to square off against a team comprised of current and former collegiate players around the Syracuse area. It remains to be seen, however, if all of the Iroquois Nationals players who will travel to Israel will be able to make Sunday’s scrimmage. That’s because three of the team’s players will participate in the third and final match of the National Lacrosse League (NLL) championship final series on Saturday night in Saskatoon. Frank Brown and Kyle Jackson are members of the Rochester Knighthawks. And the Saskatchewan Rush lineup includes Jeremy Thompson. Jeremy Thompson of the National Lacrosse League's Saskatchewan Rush. Thompson is one of four brothers who will suit up for the Iroquois Nationals at the world tournament. Jemison is not certain whether any of the three players will be able to get to Syracuse on Sunday after participating in the final of the world’s top box lacrosse loop. “A flight back to the east coast might be a challenge for them,” he said. Thompson is one of four brothers expected to play key roles with the Iroquois Nationals. Lyle, Miles and Jerome Thompson also all play professionally with the NLL’s Georgia Swarm. 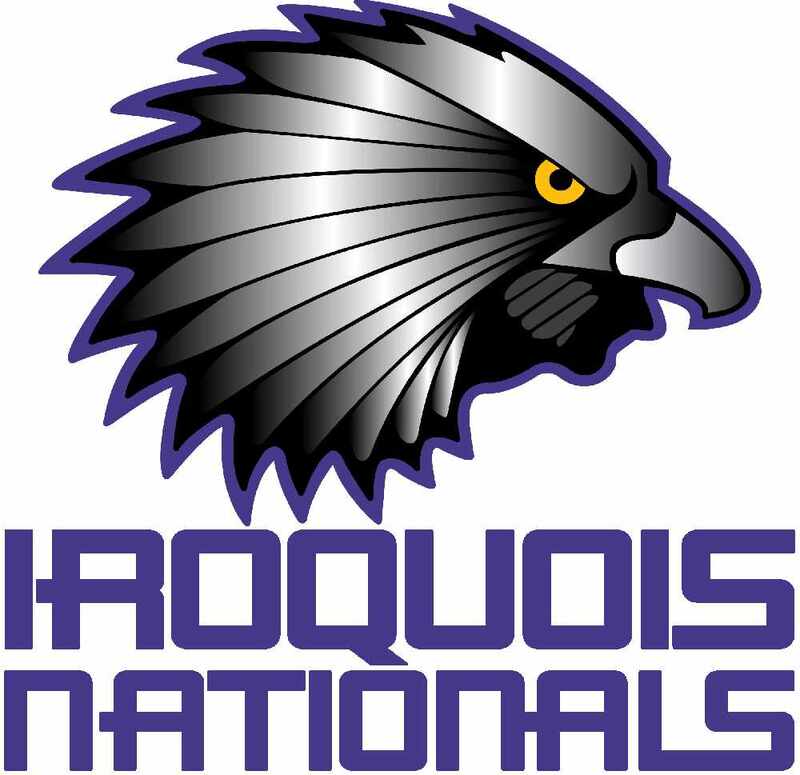 The Iroquois Nationals’ roster features a dozen athletes who play pro, either in the NLL or the Major Lacrosse League, an American-based field lacrosse circuit. Others on the team are starring for collegiate or junior squads. “This team will be a bit younger and a bit more athletic than we’ve had in the past,” Jemison said. Since they play for various teams across Canada and the United States throughout the year, Jemison added Sunday’s scrimmage is vital for the Iroquois Nationals. The Iroquois Nationals’ chances of winning a medal in Israel are enhanced by the turmoil currently surrounding the defending champs from Canada. The possibility exists that Canada won’t even participate in the world tournament. That’s because its national team players are in the midst of a labour dispute with the Canadian Lacrosse Association. In recent weeks there’s been talk of replacement players being used by Canada. The thought of Canada not even sending a club has also been raised. A total of 48 clubs are entered at the world championships. They’ll participate in various divisions based on their calibre of play and experience. The Iroquois Nationals are in the highest calibre Blue Division which will feature teams vying for the medals. The six-team division also includes Canada (for now) as well as the United States, England, Australia and Scotland. The Iroquois Nationals’ coaching staff traditionally features bench bosses from both Canada and the United States. But this time around program officials have opted for an all-American coaching staff. The head coach is Mark Burnam from Florida’s IMG Academy. Former Iroquois Nationals’ player Brett Buckbooth has now moved into the coaching ranks and will serve as an assistant coach for the team. The squad includes two other assistant coaches, Scott Marr, who is the head coach at Albany University, and University of Virginia head coach Lars Tiffany. This will mark the 13th edition of the world tournament, first held in 1967. All previous editions have been staged in Canada, United States, England or Australia. Jemison does not seem overly concerned about some of the violent incidents ongoing in Israel. “It’s always something that is in the back of your mind,” he said. “I think we’re going there for a good reason. We’re going there to play our best and make sure people in charge of security are doing their job.